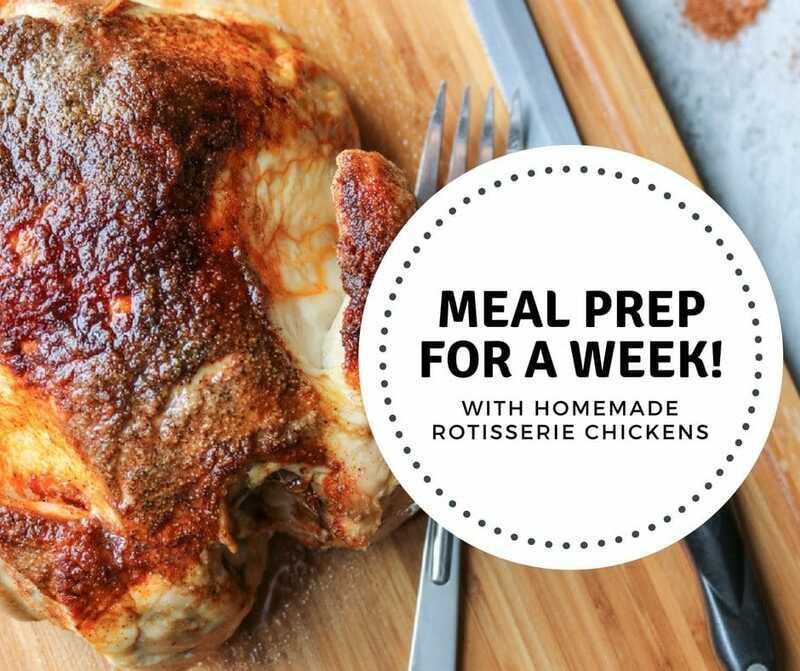 Leftover Rotisserie Chicken Recipes: A Week of Meals with Rotisserie Chicken–Meal prep by making homemade rotisserie chicken to use for 7 easy, healthy meals throughout the week with recipes for leftover rotisserie chicken. No matter what I seem to do, day in and day out, dinner needs to be made. EVERY. SINGLE. DAY. I love to eat and even love to cook, but sometimes the meal planning that goes behind it can stress me out. Especially when faced with a busy week. Go ahead, admit it, you are right there with me. Thankfully for you, I have done the leg work for and created an easy to follow meal plan that is inexpensive, easy, and guaranteed to feed your family meals they will beg for again and again. We start with Homemade Rotisserie Chicken. Do NOT be daunted by this recipe, it is literally a hands off approach to have a clean version of your favorite grocery store short-cut. 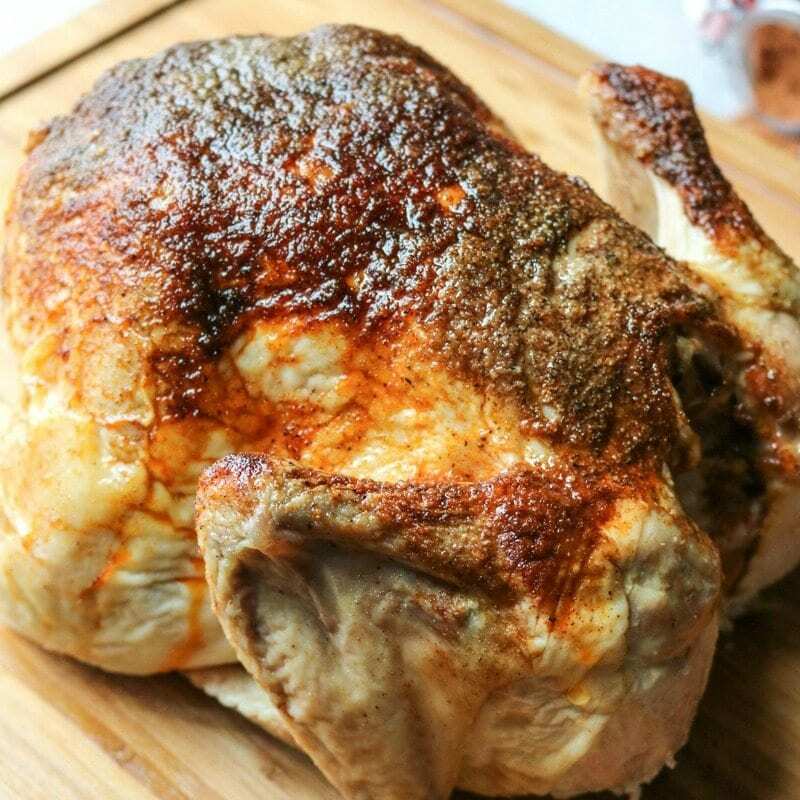 Trust me, it is SO worth making your own rotisserie chicken. It is cheaper and tastier, not to mention free of all kinds of preservatives and excess sodium. 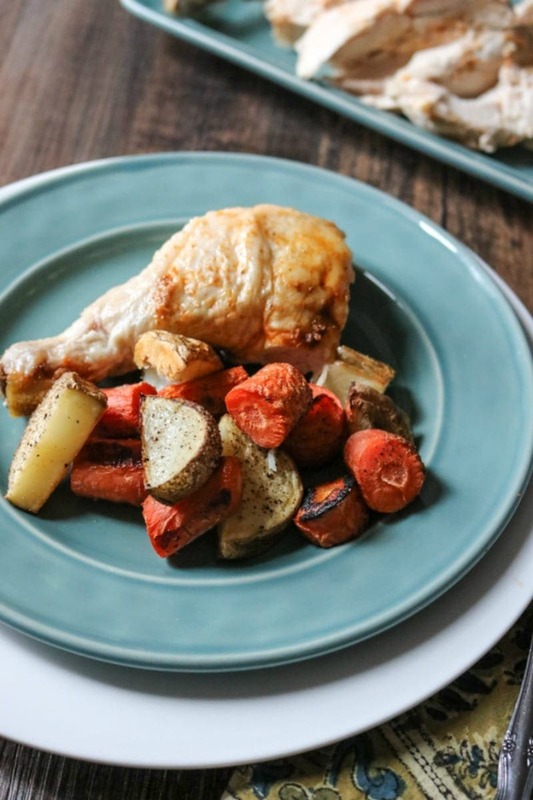 You can choose to make rotissserie chickens in the oven or in your instant pot–both take only minutes of prep work and both recipes produce juicy, tender chicken. When I am meal prepping for the week, I do prefer to make Oven Roasted Rotisserie Chicken, so I can make more than one chicken at a time, along with roasting vegetable. But you can easily use the Instant Pot to “roast” your chickens one at a time and roast your vegetables seperately. Once the chickens and vegetables are roasted, meal one is complete–along with the building blocks to 6 other delicious recipes for leftover chicken. The key to being able to make a full week of meals using leftover rotisserie chicken meat is of course starting with making the chickens. Again, my choosing to make your own chicken at home, you will save money, make it healthier, AND be able to make homemade stock. And it really is NOT hard at all! Step One: Season 3 Whole Chickens. Step Two: Peel 1 pound carrots, 3 large onions, and 1 head of garlic, saving the peels. Chop the vegetables into 1 inch chunks and add to 3 pounds red potatoes, cut into 1 inch chunks as well. Toss the vegetable mixture with 1-2 tablespoons olive oil and season with salt and pepper and pop into the oven with the chicken. The vegetables will be fine to roast for the full time as the chicken, since the oven is set at a low temperature. Step Three: Serve your family a lovely Roast Chicken with vegetables with dinner. Step Four: While you enlist someone else to do the dishes (don’t you like the way I think), you can remove the meat from the chickens and place the carcasses into a large stock pan, your slow cooker, or your instant pot and add in those peels from your roasted your vegetables. Cover with water, season with salt and pepper and a couple bay leaves and cook. Once done cooking, strain off the solids and you are left with homemade chicken stock–that you literally made from trash!! Step 5: Freeze the meat of 1 chicken (about 6 cups) 4 cups chicken stock to use for Thursday, Friday, and Saturday’s dinners. And now you are well on your way to creating the week’s remaining entrees using recipes that all feature recipes for leftover rotisserie chicken. This is a classic for reason–who dosen’t love a good roasted chicken served with perfectly roasted vegetables? This is one of my most popular recipes using leftover rotisserie chicken. 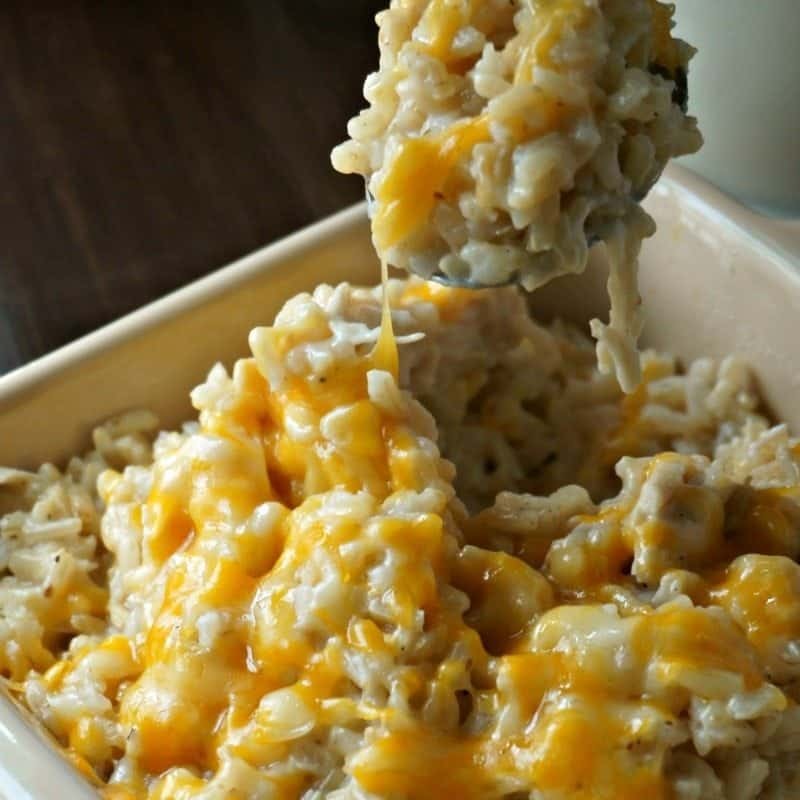 This chicken and rice tastes indulgent and creamy, but is made with wholesome ingredients you can feel good about serving your family. *If your family prefers more spice try out my Buffalo Chicken and Rice. 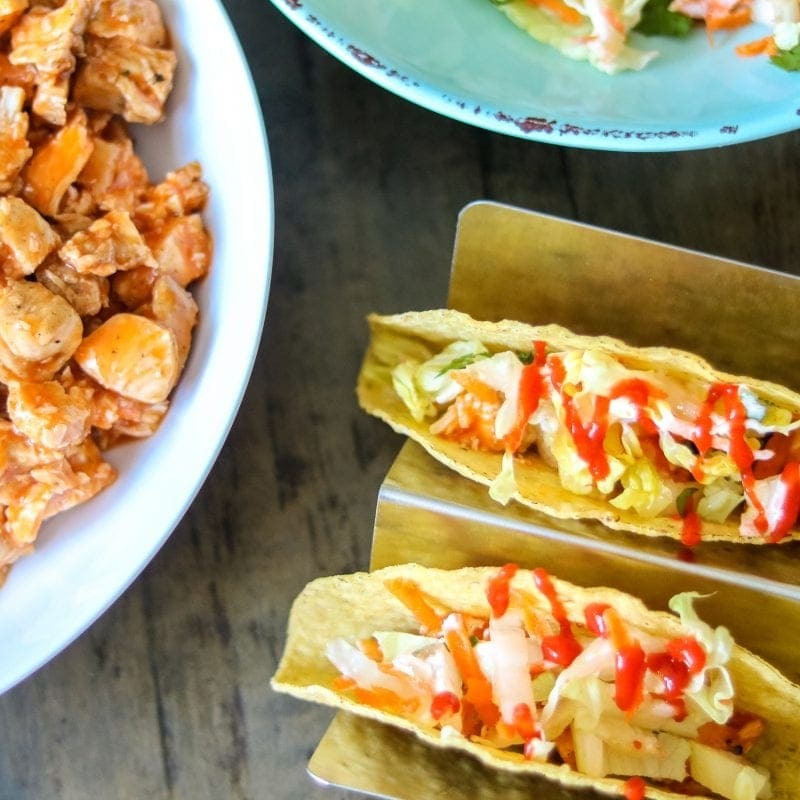 These Buffalo Chicken Tacos are PERFECT for a change up on taco night. The easy slaw made with a homemade ranch seasoning blend make these easy tacos unforgetable. *Be sure to follow the instructions for using leftover shredded chicken, not roasting chicken AND make extra slaw to use for the Buffalo Chicken Pizza later in the week. 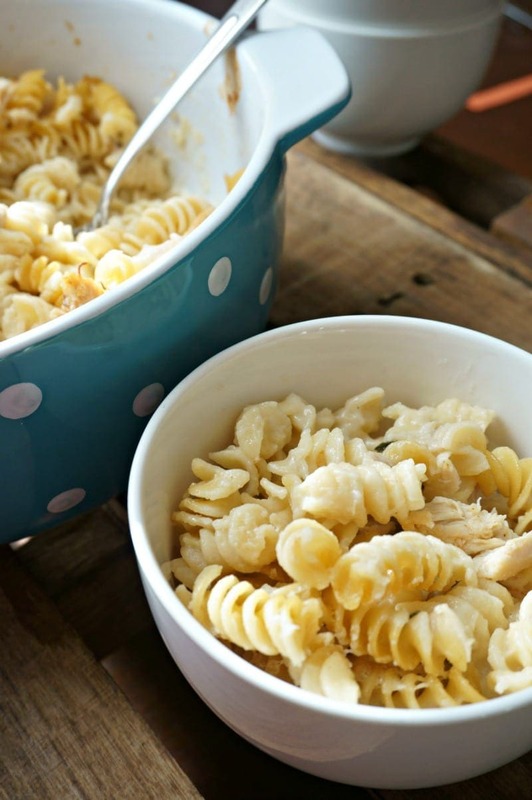 This creamy pasta made with leftover rotisserie chicken is also referred to as Amish Chicken. It was a favorite of mine growing up, and is a favorite of my kids now. **Tonight take out your frozen chicken and place in fridge to defrost for remaining week. 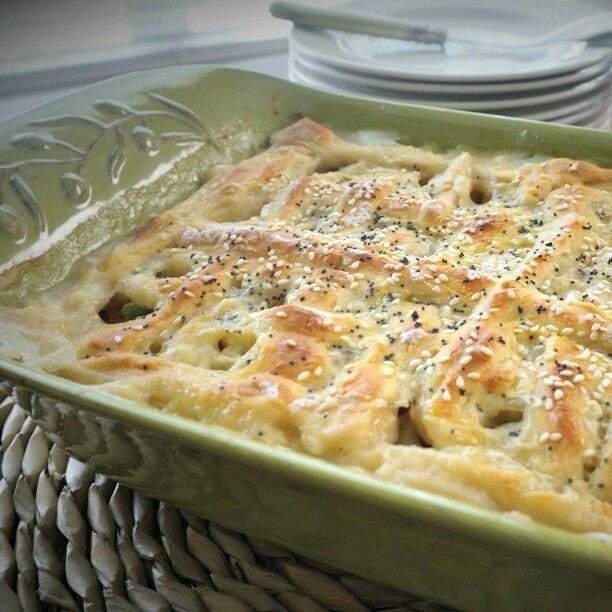 This chicken pot pie recipe is my Papa’s recipe. He would always make it from scratch and it took hours! By using leftover rotisserie chicken and the homemade stock, you can have this comforting pot pie on your table in less time but still deliver a wholesome from scratch meal. This pizza recipe with leftover rotisserie chicken is one of my all time favorite recipes. This pizza is so full of flavor. 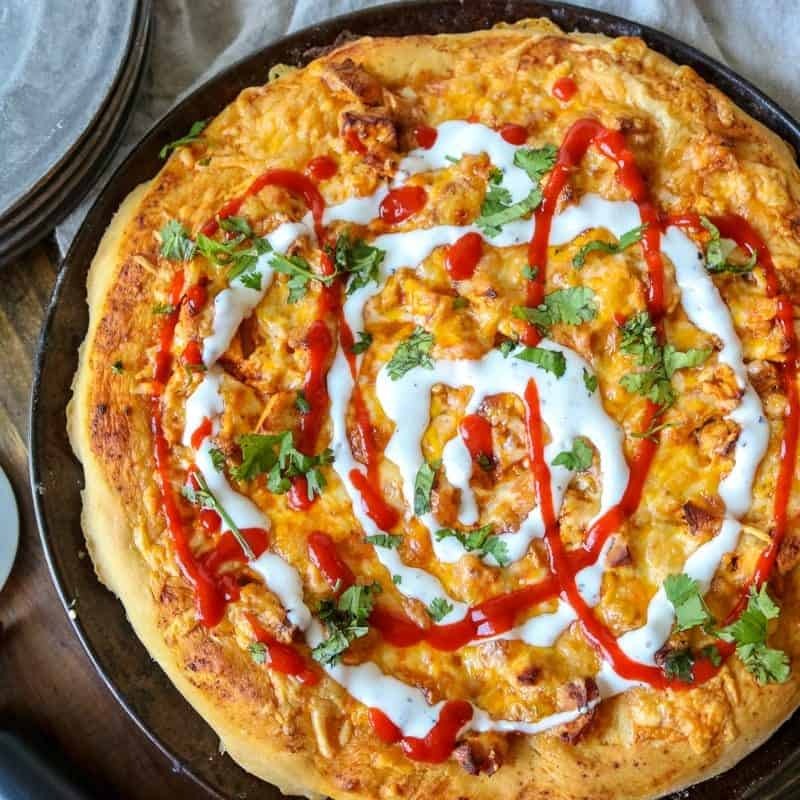 I love to serve this pizza with leftover slaw from the Buffalo Chicken Pizza for complete meal. Chicken poppyseed is a recipe I was introduced to after moving to the south. My husband immediately fell in love with this easy leftover chicken recipe. I have updated the recipe to make it a bit healthier and EASIER. This one pot recipe using rotisserie chicken is a great way to finish up using all your leftover chicken and stock! Pat yourself on the back. You now have a whole week of meals planned! Meals that are wholesome, filling, hearty, and NOT take-out! Job well done. If you don’t want to use the chicken all at once, roast and prepare as stated, but freeze the leftover rotisserie chicken in 2 cup portions in freezer safe bags. You can also freeze the chicken stock in 2-4 cup quanitites to use in the future as well. You can also try Chicken Enchiladas, Chicken Soup, Cranberry BBQ Chicken Pizza, or Southwestern Chicken Cobb Salad in place of any of these recipes. King Ranch Chicken Soup White Chicken Chili, or Chicken Chili are options as well–just use the cooked, shredded chicken in place of raw chicken breasts and decrease time on slow cooker by 2 hours. Try out Chipoltle Chicken Tortas or Pineapple BBQ Chicken Grilled Cheese for a real treat. If you would rather NOT use leftover rotisserie chicken, try out my oven roasted chicken breasts of Instant Pot Chicken Breasts to use in these recipes. How long is is safe to keep cooked chicken in refrigerator? Raise your hand if you have called your mom more than one time to find out the answer to this? Or maybe you have googled it every time you have leftover chicken in the house? The answers for how long you can keep chicken in the fridge for vary, but in my book I prefer 4 days. I think that more than one person will tell you from experience, a week is just fine. However, to err on the side of caution, I follow the following advice when it comes to how long I keep chicken after cooking the refrigerator. I hope that these meal ideas with leftover rotisserie chicken helped you in your mission to feed your family while remaining sane. This week’s meal plan looks to be a real win in my house! I love the idea of precooking the chickens and using them through the week. All the recipes sound delicious. Thanks so much Paula! I hope you enjoy! The chicken poppyseed recipe doesn’t seem to be linked! Fixed it and please note my tips on how long to keep chicken in the fridge–not sure that came through yesterday in post.